I’ll never really comprehend what manufacturers are thinking when they dumb down a top seller. If you’re into sport bikes I’m guessing you might also be into good handling, fast acceleration and being able to put a stop to it when a cage pulls out in front of you.That’s why I’m a little perplexed at Kawasaki’s decisions in the late ’70’s. They built the Z1-900 in 1973 and it was the first bike to beat the land speed record held by the dude in the speedo on a Black Shadow(Rollie Free). It put Honda’s CB750 on it’s ear and seemed that Kawasaki was on it’s way to building the fastest bikes in the world. Then in 1976 the Z was changed to KZ. They put smaller carbs on it and tuned it differently. They lost 10hp by doing this. Wait, they went backwards in horse Power? Why would you do that? Isn’t it a race to the top? I’m not really certain of what caused them to make those changes for sure but that’s about the time emissions were coming into play. I’ve also read that the Z1’s were hard to ride in stop’n’go traffic. It seems they attempted to smooth out the beast. With all that said, I am an owner of a 1977 KZ1000 and it’s still a pretty capable bike. Unless you’re a professional rider I doubt you’d really even be bothered or notice the changes. So when I see pre 1980 Kz’s I always take notice. In my opinion you get a bike that’s very close to the coveted Z1 but at half or less than half of the price of a Z1. If you want a classic super bike but you’re on a budget these bikes are an excellent choice. Here’s what the seller of this very clean example has to say about his bike. 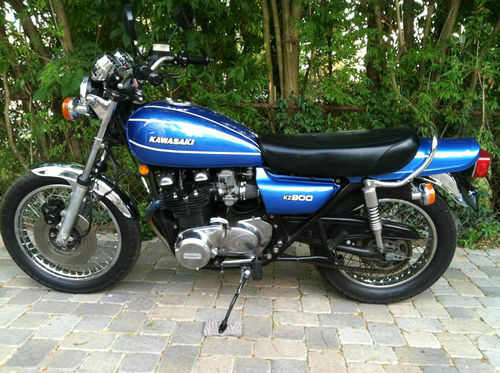 This is a low mileage example of Kawasaki’s 1976 kz900 that has been freshened up rather than restored and has maintained it’s stocker features and look. All of the body parts are original to the bike (including kz900 side cover emblems) and were professionally stripped and painted with finished with three coat of clear (and tank is rust-free). 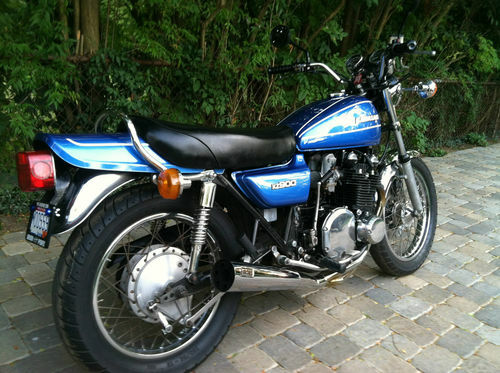 The blue paint is not a brilliant, primary blue but rather one with softer tones that looks great in sunlight (and more appropriate for Kawasaki paint of the ’70’s). The white 1/4″ stripes were added on tank and tail to make it reminiscent of the Z1 schemes of 1974 and 1975 models. Z1-R cafe handle bar (expensive item that was on the bike when acquired). The new parts were recently acquired at Z1 Enterprises, and the bike has very few miles since these additions. One item that I failed to catch was the absence of the black plastic battery box. They are readily available and will have to be added by the new owner if desired (but certainly not necessary). 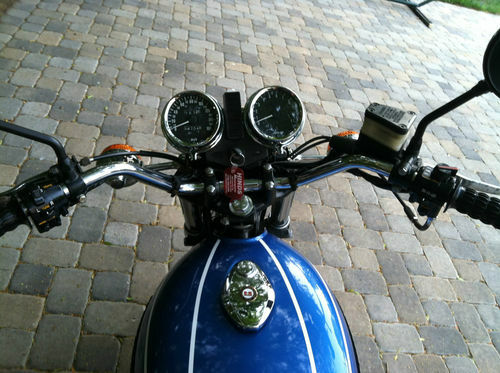 The bike is an excellent runner…very responsive and the carbs have been adjusted properly. And, the majority of the parts on the bike are original to it which many enthusiasts fine appealing. They include the wheels/ spokes, front and rear fenders, turn signals, kick start, brake pedal, brake assemblies front and back. The bike has been painted and parts changed but they kept it in a stockish style which scores points in my book. it seems a lot of the parts are repops or actual Kawasaki replacement parts specific to the bike. Like I said before if you’re looking to get a classic super bike I highly recommend this one or one from the same era. So what are waiting for? Go check it out! Next story Can I see your papers?